They prefer clam and quiet seas where they spend their days making slow movements while lying motionless at the water surface. In appearance and behavior, the dwarf sperm whale is strikingly similar to its close relative; the pygmy sperm whale. In fact, telling them apart from a distance is almost impossible. However, the former dwarf is slightly smaller and displays a larger dorsal fin than the latter. But this prominent dorsal fin means it can be confused with the bottlenose dolphin at first glance. The dwarf’s body is typically color blue/gray with a lighter underbelly area. They also have a white false gill behind each eye. The top of its snout overhangs its lower jaw and they have remarkably long, curved, and sharp teeth. This dentition is why they are often referred to as “rat porpoise” by the people of the Lower Antilles, the Caribbean. The flippers are broad but very short. very short and broad. Like the other sperm whales, the dwarf also has the spermaceti organ in its forehead. A particular distinguishing feature that it shares with the pygmy sperm whale is that both species can expel a dark red cloud of substance when they are frightened or attacked. Much like the ink that squid eject. Though this species is normally solitary, they may occasionally swim in small pods. This whale is listed as Data Deficient by the IUCN. The maximum length for makes is 2.5 meters (8.2 feet) and females 2.7 meters (8.9 feet). About 272 kg (600 lbs). The dwarf sperm whale is a slow and deliberate swimmer. Normally, they swim around at about 3 knots (3.5 mph) but spend a lot of time floating motionless at the surface. 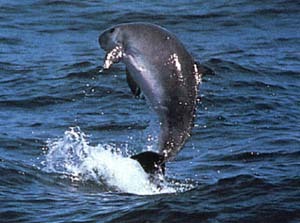 Dwarf sperm whales are very small whales; even smaller than several dolphin species. These creatures are among those hunters targeted during the commercial whaling era. Today, Indonesian and Japanese fishermen hunt them using harpoons. In addition, this whale tends to swim closer to coastal areas with high human activity. Consequently, it’s more vulnerable to human activities especially pollution and fishing. Dwarf sperm whales are very difficult to spot at sea owing to their timid behavior. Although they rarely approach boats, they may allow boats to approach them. The Dwarf Sperm whale has a small underslung jaw and false gills so people sometimes confuse it with sharks. This species attains sexual maturity at between 2.5 and 5 years of age. Or when they grow to 2 meters (7 feet) in length. Their calving season lasts about four to five months and females give birth every other year. Gestation period is between 9 and 11 months. Newborn calves measure just 1.0 meter long and their mothers wean them after one year. This species feeds mostly on squid and octopus, crustaceans like shrimp and crabs, and a variety of fish. The Dwarf Sperm whale and Pygmy Sperm whale are the only cetaceans that can eject “ink” to scare away predators like squid do. The population of this animal remains unknown. The Agreement on the Conservation of Cetaceans in the Black Sea, Mediterranean Sea and Contiguous Atlantic Area. The MoU Concerning the Conservation of the Manatee and Small Cetaceans of Western Africa and Macaronesia also known as the Western African Aquatic Mammals MoU. The Memorandum of Understanding for the Conservation of Cetaceans and Their Habitats in the Pacific Islands Region (Pacific Cetaceans MoU). Pollution and human activities. Several stranded dwarf whales had large quantities of plastic and garbage in their intestines. Degenerative heart disease, heavy parasite infestations, and immune system problems. Interference from underwater sonar and marine noise. There is still insufficient data to determine the exact effect of these activities on dwarf sperm whale populations. For now, the IUCN lists it as a Data Deficient species. This whale belongs in the family Kogiidae and genus Kogia along with the pygmy sperm whale. Both species were regarded as the same till a scientist at the Smithsonian Institution in Washington determined that they were separate species in 1966. The sperm whale is also a close relative. The dwarf sperm whale is a deepwater species but interestingly prefers to swim close to coastal areas. They frequent the waters off Australia, New Zealand, Indonesia, Chile, south Brazil, and South Africa. Other areas include Oman, the Persian Gulf, the Maldives, Japan, British Columbia, California, Gulf of California, Hawaii, Gulf of Mexico, south-east USA, and north-west Europe.